Faye Alexandrakis has always been fascinated and inspired by the complexity of the human body. 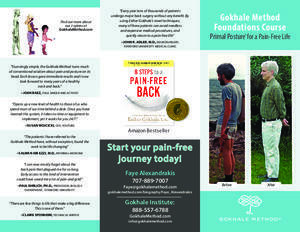 Her keen interest in movement and posture led her to become a Chiropractor in 2003 and the Gokhale Method was a natural progression of her passion to help her patients gain a personal kinesthetic awareness and to move pain- free, with poise and ease, the way their bodies were designed to function. The variety of effects her students experience when she helps them free their body structure from patterns of holding that are no longer useful continue to amaze her. Faye feels privileged to empower her students to transform their lives and take charge of their own health in the unique and innovative- yet simple - manner of the Gokhale Method. Faye's other passions include camping, hiking, getting lost in the Sierra-Nevadas, and making a mess with her oil paints in her attempt to create a masterpiece. She is happy to report that since implementing the Gokhale Method principles, she can now hike 15 miles without mid-back pain or soreness.